The prairie leapt in riotous colors as a gentle breeze rustled the wildflowers. Purple leadplant bowed and yellow coreopsis bent as I surveyed for bees. It was July 2014, and I was visiting Roscoe Prairie Scientific and Natural Area in Stearns County. This high-quality site potentially hosted great bee diversity, and the clear, sunny sky was warming bees to flight. Swish! I flicked my net at a bumblebee that zipped between the flowers. As I transferred the bee into a jar, I wondered if Frederic Washburn had enjoyed similar landscapes. Washburn worked as an entomologist in the early 1900s, and he published Minnesota's first state species list of bees in 1919. Unfortunately, his records are incomplete, and he included only six of Minnesota's 87 counties. 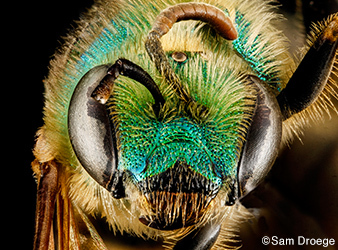 Discover the exquisite detail of Minnesota's native bees through a gallery of close-up photos by U.S. Geological Survey researcher Sam Droege. A county record is the first time a species is reported from a county. DNR field researchers recently turned up what was thought to be the first record of the golden northern bumblebee (Bombus fervidus) in Stearns County. However, further investigation revealed preserved specimens of Bombus fervidus at the University of Minnesota Insect Collection. This is why, in addition to fieldwork, Minnesota Biological Survey researchers visit museums, read records, and search databases. The future state species list of bees will help people to compare past and present bee records with ease. Minnesota has at least 20 bumblebee species, including six (above) that researchers think are declining. In 2014—almost a century later—the DNR's Minnesota Biological Survey successfully applied for a research grant to update the state species list of bees and survey these pollinators on prairies and grasslands. Less than 2 percent of Minnesota's native prairie remains. Without bees, these prairie patches might be increasingly dominated by grasses or other wind-pollinated plants. Bees are often the most efficient pollinators, partly because their branched body hairs transport pollen among flowers. Many prairie forbs would struggle to reproduce without the bees that are vital go-betweens. To protect such plants and their pollinators, scientists must first learn which bee species live in Minnesota. With funding from the Environment and Natural Resources Trust Fund, as recommended by the Legislative-Citizen Commission on Minnesota Resources and approved by the Legislature, this two-year project began July 1, 2014. DNR entomologists inventoried museum specimens in the Twin Cities, Duluth, Fargo, Madison, and Chicago. This work has already raised Washburn's report of 66 species to today's tally of 350 to 400 native species. By comparing diversity and abundance at different prairie sites, the DNR is gathering information that could help land managers protect pollinators. We might discover that prairie restorations host bee species that are missing from native prairies, or vice versa. This information would help land managers evaluate the flowering plants and nesting habitat at their sites. The surveys will also help standardize monitoring techniques that could be used year after year to track changes in native bee populations. This summer, two entomologists and two botanists are surveying Minnesota's prairie region. One team, based out of Granite Falls, looks for bees on a southern route that includes Des Moines River SNA, Glacial Lakes State Park, and 14 other sites. The second team, stationed near Thief River Falls, follows identical protocols at 12 more sites. Their northern route winds through Caribou Wildlife Management Area, Helliksen Prairie Waterfowl Production Area, and other places. The researchers set out bee bowls once a month at each site. The bowls are painted bright yellow, blue, and white to attract pollinators, and they're filled with soapy water that catches inquisitive bees. After the bowls have been out for 24 hours, the entomologists return to collect the specimens. Research shows that collecting bees this way does not negatively affect their populations. The bees are placed in an ice-filled cooler and later stored in a freezer in the lab. These specimens can remain frozen for weeks or months until they're pinned, labeled, and sent to the University of Minnesota Insect Collection. Each specimen is a valuable data point that provides clues about the lives of bees. Despite often being overlooked, all native bees play a large role in our ecosystem. In addition to supporting native plant communities, native bees pollinate food crops including apples, blueberries, cranberries, and much more. By pollinating plants, they also create shelter and food for wildlife. Bee-pollinated plants produce seeds, nuts, and berries that fuel many bird species. Bees also pollinate plants that prevent soil erosion and store carbon. For their small size, bees have powerful impacts on our landscapes. In addition to the European honeybee (Apis mellifera), Minnesota has many groups of diverse native bees. Different species emerge throughout the season, and Minnesota's bees typically fly from mid-April to mid-October. They can be found everywhere from gardens and orchards to state parks and wildlife management areas. You might be amazed by a rainbow of diversity if you look closely while bees are sipping nectar. Watch patches of blooms for large, fuzzy bumblebees and check colorful flowers for small carpenter bees (Ceratina spp. ), which are about the size of a grain of rice. Keep your eyes open this summer for yellow-faced bees (Hylaeus spp. ), metallic blue bees (Osmia spp. ), brilliantly green bees (Augochlora pura), and black-and-white bees (Melissodes bimaculata). These are some of our flashiest species. Minnesota has at least 20 species of bumblebees (Bombus spp. ), including six species that researchers think are declining. These bumblebees and other pollinators face many complex challenges. Their food sources may disappear when invasive plants outcompete native flowers. Herbicides may remove milkweeds, dandelions, and other plants that provide pollen or nectar. Insecticides, including chemicals known as neonicotinoids, can directly threaten pollinator health. Parasites and pathogens stress bees, and habitat loss removes places where they forage or nest. Native bees have diverse nesting strategies. About 70 percent of bee species nest underground. Some bumblebee queens, for example, fly close to the ground in spring, searching for an abandoned rodent burrow where they can build a nest. Other species dig a tunnel into the ground and excavate passages that end in small cells. The adult female collects pollen and shapes it into a ball for each cell. She usually lays one egg on the pollen ball and closes the cell. Most bees have an annual life cycle in which the egg matures to a prepupa and rests through the winter. The next spring or summer, it transforms into an adult and emerges. Then the cycle begins again. You can support pollinators. Gardeners should provide at least three species of blooming plants during spring, summer, and fall to give pollinators reliable food sources. Make sure to ask at your local garden center if the plants were treated with neonicotinoids, which can harm pollinator health. Plant native species whenever possible because they often have more pollen and nectar than cultivars do. You can also provide nesting spots for cavity-nesting bees. These solitary species usually hesitate to sting people. Unlike social honeybees, which have thousands of bees per hive, solitary species rely only on themselves to maintain their nest, so trying to sting you is risky behavior because they might be injured or killed. Of course, solitary bees will sting if provoked or trapped between your clothing and your skin. People who are allergic to bee stings should take the same precautions they use whenever they enjoy the outdoors. Leave vegetation such as raspberry canes and hollow grasses standing through the winter in case cavity-nesting bees are developing inside. When spring arrives, you can put out a simple nesting block for cavity-nesting bees, and gentle local bees will move in. If you want to put up a nesting block, it's easy to buy one at a garden center or build your own following instructions from the nonprofit Xerces Society. Make sure to clean or replace your nesting block every other year so it won't harbor diseases or parasites. Find more tips for protecting native pollinators. All bees fall on a spectrum of sociality. Honeybees, for example, are a highly social species. They work together to build a hive and tend the young, with overlapping generations of workers. Bumblebees are also social and have a queen. Despite popular perception, however, only a small percentage of Minnesota's bee species are as social as honeybees and bumblebees. Some species are not quite social and not quite solitary. These are known as communal species. One example is a shiny green sweat bee (Agapostemon virescens), which is common on prairies at Lac qui Parle WMA. It's one of the bees I encountered most frequently during pilot surveys in 2013. These bees live underground and share a common entrance tunnel. Once inside, each adult female builds and provisions her own nest. It's similar to single mothers sharing an elevator but maintaining their own apartment and carrying home their own groceries. Adult females take turns guarding the nest entrance, so bee researchers think they gain an extra level of protection against parasites. Other species are solitary nesters. Leafcutter bees (Megachile spp.) employ a life strategy in which a single adult female starts a nest and provides pollen for her young. She dies before her offspring hatch. While some solitary bee species live underground, others live in cavities. About 30 percent of bee species are cavity nesters. To start a nest, these bees find a pre-existing space such as a crack in a concrete wall or an abandoned beetle tunnel in dead wood. Some species line each cell with leaves, petals, or other materials. Some species line their nests with plant resins or leaf hairs. Other cavity nesters live in hollow plant stems. Yellow-faced bees and small carpenter bees may nest inside raspberry canes, sumac branches, or tall grasses. At Roscoe Prairie SNA, I held the bumblebee in its jar toward the light. A shiny, triangular patch on the hind leg told me this was a female. Her small size indicated that she was a worker, out collecting pollen for her siblings in the nest. I looked more closely to see her color pattern—I counted one, two, three, four yellow stripes on her abdomen and one black bar between her wings. These marks meant she was a golden northern bumblebee, Bombus fervidus. I quickly checked Washburn's state species list from 1919 and smiled. This was a new county record.